Everything has a first step, and this course is the first step towards your goal of mastering mathematics to make a career out of it. From the fundamentals of mathematics, to the concept of probability and counting math, this course will educate you on everything you need to know to know on general mathematics to move onto the more advanced aspects of mathematics. This course is designed to familiarise you with the fundamentals of mathematics that will be crucial in helping you solve problems, work with shapes, numbers and figures and to reason with issues in a logical manner. You will also get to explore the concept of probability and counting math to apply it in real life scenarios. By the end of this course, you will have a very solid basic knowledge on mathematics to lay the foundation for you career in mathematics. You can also use this certificate to follow up on the more advanced courses in mathematics to advance your knowledge. Free CV Writing and Interview Skills Pack available with this course. Get 2 days (48 hours) of free access to one of our 140 course strong course libraries, we will issue access upon your request when you have purchased a course. Our Course is fully compatible with PC’s, Mac’s, Laptop, Tablet, and Smartphone devices. So, you can access your course on Wi-Fi, 3G or 4G. This online course is comprehensive and designed to cover the key topics listed under the curriculum. The assessment would consist of an MCQ exam. The learners will be taking it online at the end of the course. The results would be displayed right after the submission of the completed exam, stating whether learners have qualified and would receive the certificate for the course. 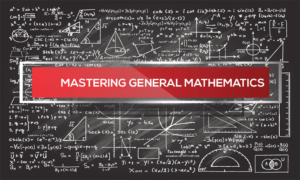 All students will receive a certificate in Mastering General Mathematics, which is accredited by IAP and CPD, upon the successful completion of the modules. There is no experience or previous qualifications required for enrolment on this course. It is available to all students, of all academic backgrounds. However, it is recommended to have basic understanding of English language, literacy, numeracy and ICT skills.